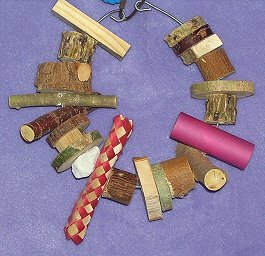 It is very important that only safe metals are used for the toys and that includes the links or rings to hang the toy. There are several sources on the internet where you can purchase toys and toy parts so you can make your own or purchase toys already made. One place to get safe wood toy is from Our Store of course! However, if you are looking for parts to make your own you can try CA Bird Nerds. Since they also sell bird products, not all the products sold on their site are safe for chins. 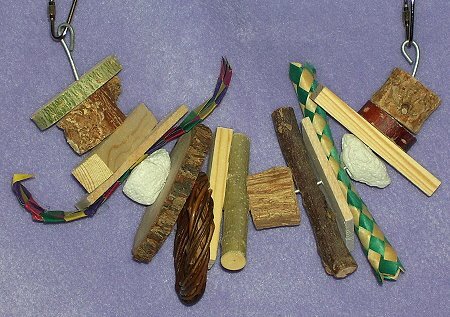 I make our own toys by using 16 gauge galvanized wire that I purchase at any Lowe's or Home Depot. 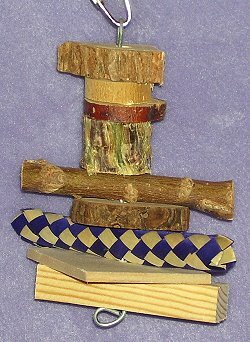 I then add several different chin-safe chew toys to give variety and different textures for the chins to chew. I don't like to use a chain to make toys with. There is always the possibility that a chin can get their front teeth stuck in a link. Below are some examples.